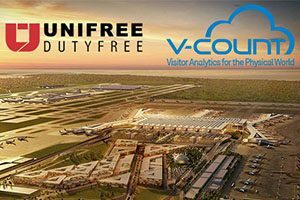 No Comments on Unifree Duty Free Chose V-Count Solutions For The Biggest Duty Free In The World! Our solutions will cover the entire duty free area, where we will analyze traffic and customers behavior with people counting, multicamera Heatmap and queue management solutions, in order to efficiently allocate staff, optimize marketing campaigns and traffic with actionable data. With our 550+ customers in many geographies, we are continuing to serve many valuable clients with our innovative technology and customer centric approach.